Window Arch, the object of our search. 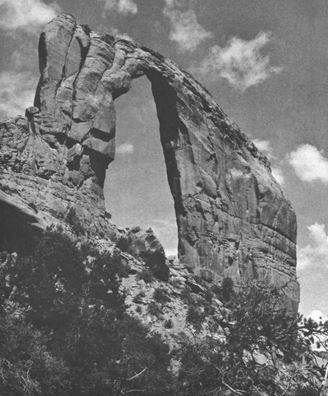 Window Arch, the object of our search MOST OF Western America is very prolific in frontier history. There are the Sutters Forts, the Dodge Cities, the Roaring Camps, all symbols of the lusty and boisterous growth of an intrepid young nation. But the student of human antiquity is acutely aware of a much deeper reaching segment of Western Americana that might well hold the key to the dawn of civilization in the Western hemisphere. compact station wagon and took to the open road. Our idea was to maintain enough self-sufficiency to spend as much time as desired in any locale without dependency upon commercial facilities. By late evening of the first day out we were within the boundary of the Acoma Indian reservation in northwestern New Mexico, and comfortably situated in an abandoned mud and wattle hogan. The basic design and construction of an Indian hogan has not changed in 2000 years, yet it remains one of the most efficient refuges from summer heat or winter chill ever devised by man. This one was no exception and we were smug with satisfaction as we relished a delicious but simple Dutch oven meal of Polish sausages smothered in butter steamed cabbage. It was nearly a race between us and the early morning sun as we climbed a steep foot path to the mesa top, where Acoma Pueblo, The Sky City, as it is called, lay in its lofty berth. But the sun was already there, casting slanting rays across the face of the great Acoma Mission, displaying in strong texture the imprints of thousands of laboring brown hands that patiently patted clay plaster to the stone walls in years past. 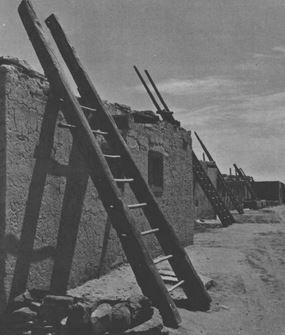 The design was exemplified and echoed in the dozens of multi-storied dwellings that crowded the mesa top. Acoma Pueblo, with the exception of the mission, stands today much like it did in pre-Columbian times, and much like it did when Coronado’s captains came this way in 1539 in search of the fabled Seven Cities of Cibola. No man can say just when Acoma was built on its natural stronghold and Indian tradition offers no clue. Historians agree though, that The Sky City is the oldest continuously inhabited settlement in North America. remains a living symbol of dedication to purpose and of human dignity. slanting rays across the face of the great Acoma Mission, displaying in strong texture the imprints of thousands of laboring brown hands that patiently patted clay plaster to the stone walls in years past. The design was exemplified and echoed in the dozens of multi-storied dwellings that crowded the mesa top. Our third day closed with the riotous profusion of color characteristic of desert sunsets. Against this backdrop the enormity of Shiprock stood as an elevated guide post, easily seen from over a hundred miles away. And now, by the light of a full moon, we were cautiously working our little station wagon along the faintest suggestion of a road that would eventually terminate near the base of Shiprock. to lay salted side up for a few minutes until the salt had dissolved into the meat. The chops were then placed in an old fashioned wire toaster and propped, with the salted side against the bank of hot coals. They were allowed to broil in this position until the juices began to ooze from the fork perforations on the other side. They were then turned and broiled until brown. The chops were complimented with fresh tomatoes and cool mugs of buttermilk. No king, vagrant nor royal ever had it so good. Navajo call it. Their legend says that this was the Great Bird that brought their ancestors down from the north, and then nested here to guard over them and their descendants for all time and eternity. inactive, the molten lava in its throat cools to a solid state. The cone, composed of ash and minute particles of lava, erodes away to leave the solidified core standing as a monument to the processes of nature. These formations are called volcanic plugs, and are quite often common through the Four Corners country. 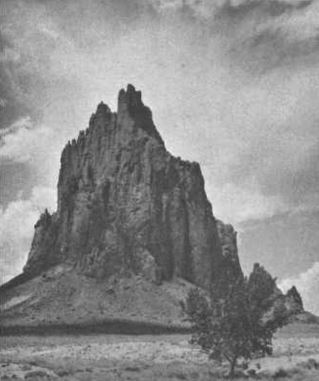 Such is the stature of Shiprock, New Mexico. We had heard sporadic tales of a magnificent natural arch lying in the Kah Bihghi Valley, somewhere south and west of Shiprock. This arch, we were told, dwarfed the fabulous Delicate Arch of Arches National Monument and rivaled in size any known arch in all the Canyonlands country. In search of it, we were soon pounding along a dirt road toward the distant Carrizo Mountains. Somewhere we crossed the unmarked Arizona-New Mexico border and came upon two Navajo lads playing in an old sheep corral. Our questions concerning the location of the arch, which by now we had learned was called Window Arch, were met with the brevity of a pointed finger and a grunt. The lads, perplexed at our inability to comprehend their directions, climbed into our car and again pointed. Following the pointing fingers, we thumped over stones, dragged through dry washes and climbed embankments that thoroughly taxed our faith in the pluck of the little station wagon. Our relief was audible when the boys signaled a halt. Before us, in astonishing grandeur, stood Window Arch. All that had been said of it was true! Window Arch stands in what is geologically known as the Morrison Formation, a sandstone formation of pastel reds, oranges and yellows, which collides abruptly with the blue sky. Window Arch was formed by the slow process of erosion— a grain of sand, a pebble, a gust ofwind a drop of rain, until eons had passed and the colossus of nature’s handwork was on exhibition. If “Deserted Valley” were translated into the Ute Indian tongue, a word like “Hovenweep” would be derived. Hovenweep, then, is the Ute name applied to the deserted canyons west of Cortez, Colorado and north of the San Juan River. Within the confines of these canyons lie some of the most spectacular archaeological remains in all the Southwest. It was here, on our fifth day, that we felt ourselves standing upon the threshold of yesterday. We explored and photographed the pre-historic ruins, some of which had been built as early as 400 A.D. and others as late as 1250 A.D. 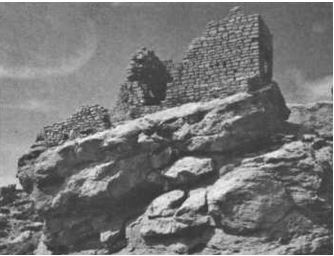 There were round towers, square towers and D shaped towers, all strategically located to guard canyon approaches to the main dwellings. There were secondary towers, located in defensible sites near the precious springs, and there were rooms built in the cool shade of overhanging shelves of sandstone. Most spectacular of all, though, were the multi-storied pueblos perched upon the very brink of the sandstone cliffs. Frontally located loop holes commanded a panoramic view of hundreds of square miles of indescribable desert scenery. Indeed, from here we could see Shiprock, over 75 miles away, like the prow of a giant ship bearing towards us over the distant horizon. Standing amidst such eloquent monuments to a vanished civilization, we were in unanimous agreement that Hovenweep was the high light of our trip. When the day was ended and we pointed our station wagon toward our air-conditioned life with comfortable beds and clean clothes, we were ready to go home,but each of us knew in our hearts that another Vagrant Holiday awaited in the not too distant future.